Carrots are known for their multiple benefits for the skin. The high content of beta-carotene and antioxidants are thought to provide the skin with extra protection from the elements. This makes a great soap for veggie lovers! INCI Ingredient Label: Palm Oil, Coconut Oil, Olive Oil, Water, Sodium Hydroxide, Pureed Carrots, Poppy Seed. NOTE: This project and these instructions have been written for someone who has experience making soap and knows the potential dangers due to working with sodium hydroxide. It will not outline all safety methods of working with dangerous chemicals; it is simply a soap recipe for advanced soapmakers. Puree the cooked carrots or use carrot baby food if preferred. Put on your protective gear (gloves, goggles and mask). This is very important since you will be working with an extremely caustic base that can and will burn you if you touch it. Noxious fumes are also released from the exothermic reaction that occurs when you mix the sodium hydroxide with water. Prepare lye solution. Place pureed carrots and water together and stir. Add lye slowly and stir. Set aside and let it cool. Melt the coconut and palm oil in double boiler or microwave until melted. Add olive oil to melted oils, stir and set aside. When the lye and oils have cooled down to between 100°-120°F, pour lye solution into liquid oils and hand stir for a minute. Then, using a stick blender, blend with small bursts and stir until it is emulsified to a light trace. 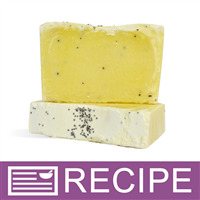 Sprinkle the desired amount of poppy seeds in the soap batter and stir - save some seeds to sprinkle on the top. Stick blend until soap comes to full trace. 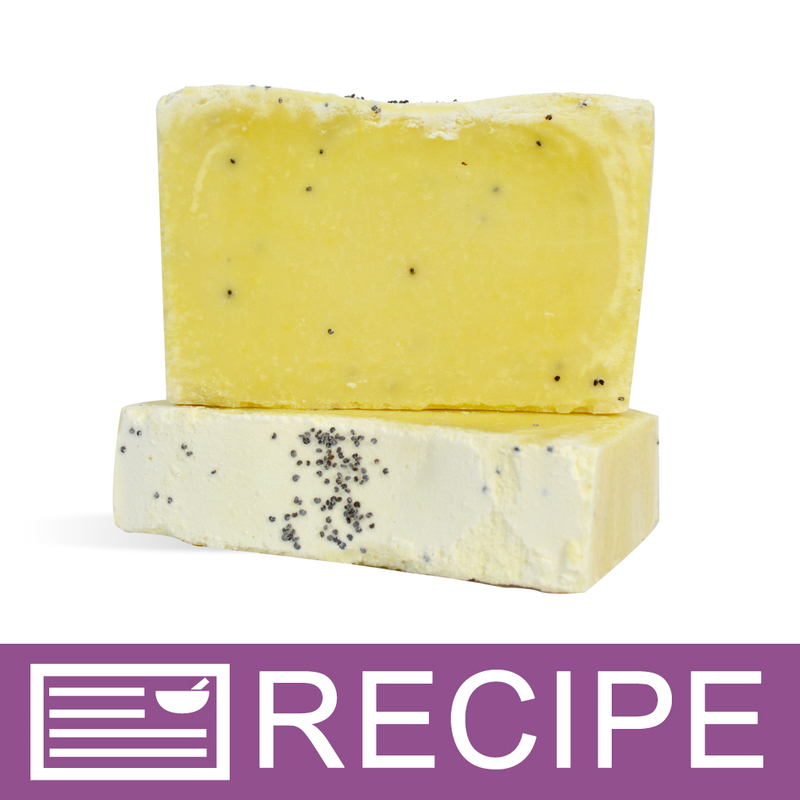 Pour soap batter into the Regular Loaf Silicone Mold 1501 and sprinkle poppy seeds down the middle. Gently tap the mold on the counter to remove any air pockets. Let sit in mold for 24-48 hours. Remove soap from mold and slice into bars. They will have a nice light-orange natural color. If soap is still soft, place in freezer for 45 minutes to help pop the loaf out of the mold. Let cure for 4-6 weeks. "Hi, Can you make this in Hot Process Soap? If so when would you carrots? Thanks!" Staff Answer Yes, you can make this as a Hot Process soap. In researching your question, we believe the puree should be added at trace. You may want to post this question on a soap forum to see if others have tried doing this. "I would like to use an FO in this recipe, but I see you have not included it. I am wondering if I do use an fo, would there be some negative reaction with the carrot puree? and would my product still have a yellow color, (if I use an fo without a vanilla content)?? Much appreciation." Staff Answer We have used a fragrance with this recipe that contains carrot puree: http://www.wholesalesuppliesplus.com/education/recipes/tangerine-daffodil-with-carrot-puree-CP-soap-loaf.aspx. There is no way to know how a fragrance might change the color of the soap. Some fragrances may have a golden tint to them which may affect the color of the soap. You would need to test that. "Is there something I could use to substitute palm oil? Maybe lard/tallow? " Staff Answer You can substitute either for the palm oil. Just make sure you run your substitutions through a lye calculator. "I love this! Thank you. My question is no fragrance used? Will it smell like carrots?" Staff Answer Good question! The soap does not have any carrot odor. "how do u get that rustic top on the soap, mine always comes out smooth, but i would like it to be more rough on top, please advise thanks kimberly gatti "
Staff Answer When we made this recipe, the top ended up having a thick layer of ash and we really liked the way it looked.